Home » Bible and Beyond » Patriarchal Burial Site Explored for First Time in 700 Years, Nancy Miller, BAR 11:03, May-Jun 1985. Patriarchal Burial Site Explored for First Time in 700 Years, Nancy Miller, BAR 11:03, May-Jun 1985. Twelve-year-old girl lowered into Cave of Machpelah. Ma‘arat Ha-Machpelah, the cave of Machpelah, where the Bible says Abraham, Isaac, Jacob, Sarah, Rebecca and Leah are buried, is one of the best-known but least-explored sites in the entire Holy Land. For centuries Jewish, Moslem and Christian pilgrims have wended their way to Hebron, but few have plumbed the cave’s subterranean mysteries. Above ground, the only complete Herodian edifice still standing marks the site—a magnificent structure, called in Arabic Harama el Khalil, the Enclosure of Abraham (the friend of God). Inside the enclosure is a raised courtyard, a mosque and a network of passages and rooms built over the centuries by numerous conquerors, each wishing to leave his imprint on the patriarchal burial ground. A rich folklore has developed about the shrine, its history and those buried below. According to Jewish, Christian and Moslem legends, not only are the patriarchs and their wivesb buried at Machpelah, but also Adam and Eve, Esau and the 12 sons of Jacob. Some Jewish traditions hold that the path to the Garden of Eden lies within the cave. Other stories focus on the visitors who were able to bypass the guardians of the shrine, and enter the tombs. Those “insolent” enough to do so, we learn, were almost always punished. Some visitors simply swooned before the glory of the patriarchs; others died in a horrible conflagration; still others were struck blind. The first modern investigation of the subterranean region was conducted in 1967, shortly after the Six Day War. Under the cloak of night, Moshe Dayan entered the shrine and lowered a 12-year-old girl with a camera into a narrow hole in the floor of the mosque, thereby ending an official 700-year-old ban prohibiting non-Moslems from entering the area. Although a technical report of Dayan’s visit to the cave was published in an obscure Hebrew journal in 1976,1 few Americans are aware of it. It should be noted at the outset that—unlike some medieval visitors—Dayan failed to find the bones of the patriarchs, or even of their wives. Although Dayan did investigate the site, what lies under the floor of the shrine remains largely a mystery. According to the Bible, when Sarah died, Abraham bought the cave of Machpelah from Ephron the Hittite and buried his wife there. Sarah died in “Kiryat Arba, now Hebron” (Genesis 23-2). At that time, Abraham was, as he told the children of Heth, a sojourner and stranger “living among you.” The Hittites offered to give him “the choicest of our burial places” (Genesis 23-6). But Abraham insisted on purchasing some property—the cave of Machpelah, he asked for—at the full price, so there would be no question about his ownership (Genesis 23-9). 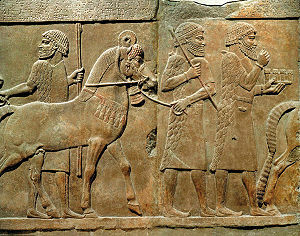 Ephron the Hittite fixed the value exorbitantly 400 shekels of silver. But Abraham paid it—“at the going merchants’ rate,” the text emphasizes (Genesis 23-16). For this, he acquired title to the cave, the field, and all the trees that grew on it. “Thus the field with its cave passed from the children of Heth to Abraham as a burial site” (Genesis 23-20). When Abraham died, Isaac and Ishmael buried their father in the cave of Machpelah (Genesis 25-9). Later, Jacob, the third patriarch, as he lay dying in Egypt where his son Joseph was vizier, asked his sons to carry him back to Canaan so that he too might be buried in the cave of Machpelah. Jacob recounts the history of the site, and it is from him that we learn that Isaac and Rebecca had already been buried in the cave. “And there I buried Leah,” Jacob concluded (Genesis 49-31). After his death, Jacob was embalmed, and his body was carried back to the cave of Machpelah for burial (Genesis 50-13). The Bible makes no further mention of the cave of Machpelah. Apparently tradition had marked the site, which remained uncovered, open to the visitations of one and all. It was not until thousands of years later that history records the construction of an edifice to honor the memory of those believed to be buried there. It seems fitting that Herod the Great (37–4 B.C. ), the monumental builder of the Holy Land, would sponsor the erection of the cyclopean enclosure around the cave thought to contain the remains of the patriarchs and their wives. Also, both enclosures are oriented to the points of the compass. There is, however, a difference. The walls of the Temple Mount enclosure are oriented quite precisely north, south, east and west. At Hebron, it is the corners of the enclosure (and not its length or width) that are oriented north, south, east and west. The Herodian architect chose to build the structure so that it appears to be nestled into Djebel (Mount) Dja‘abireh. As a result, we must speak, somewhat awkwardly, of the northeast side, the southwest side, the northwest side and the southeast side. As on the Temple Mount, Herod created a flat surface inside the Machpelah enclosure. Then he paved the floor with huge paving stones said to be about three feet thick. The enclosure at Machpelah is the only complete Herodian edifice that has survived to this day. Because the roofless structure was built along the rocky slope of a hill, the lower part of the wall was modified slightly to fit the contours of the rock and is therefore not always straight. Perhaps the hillside was not altered in any way because the site was already considered holy. Thus the walls on the four sides vary in height depending on where they sit on the site. The walls are about six feet thick and consist of beautifully drafted stones on each side, with the space between the facing stones filled with smaller stones. The largest of the ashlars is more than 24 feet long. Each course is about 3 ½ feet high. To about a height of 30 feet, the wall is smooth. Above this, the smooth wall is interrupted by receding panels at regular intervals. Each 3-foot-wide panel recedes 10 inches, separated by 7-foot-wide panels that are flush with the lower wall. The effect is to create 25-foot-high pilasters, or engaged, rectangular columns, on the upper half of the four walls of the Machpelah. Once more, these architectural features can be observed on the Herodian Temple Mount enclosure in Jerusalem, which almost certainly had similar pilasters. Only a small fragment survived the centuries, and was seen and drawn near the northern end of the western wall of the Temple Mount. At that point a wall fragment extending above the level of the Temple platform includes the stumps of two pilasters similar to those in the upper part of the enclosure at Machpelah.9 Unfortunately, it cannot be seen today; it is plastered over as part of a house built against the wall; but we have the British archaeologist Lieutenant Claude Conder’s drawing of it and another by Count Melchior de Vogüé. This portion of the wall at Machpelah is then topped with a decorative band that extends over and outside the enclosure wall for a few inches. On the exterior western wall is a crenellated decorative cornice, probably Mameluke, which should not be confused with the decorative band. Some believe, however, that the original entrance of the Herodian enclosure is through the tomb of Joseph. Although Joseph died in Egypt and was placed in a coffin there (Genesis 50-26), before he died he required his brothers to swear that they would take his bones out of Egypt (Genesis 50-25). In Exodus 13-19, we learn that Moses himself fulfilled this pledge by carrying Joseph’s bones with him on the Exodus journey. According to the Book of Joshua (24-32), Joseph’s bones were then buried by the people of Israel in Shechem (today called Nablus). Nevertheless, a Jewish and, later, Moslem tradition arose that Joseph’s bones were buried at Machpelah. In the late 14th century, Din Ahmad al Yaghmuri, one of the site’s guardians, added a second story to the tenth-century Tomb of Joseph, known in Arabic as the kalah, the castle. For the convenience of worshippers visiting the other memorials inside the Haram, al Yaghmuri installed a cenotaph on the second story of the kalah, which was now on the same level as the interior courtyard. Finally, he pierced two more entrances into the Herodian ramparts on the southwestern wall12 (“P” and “P1” on plan). Within the “P1” opening we can still observe the internal construction of the Herodian wall. Unless the Herodian entrance to the enclosure is blocked by Joseph’s tomb, however, the original enclosure may have had no entrance. Apparently the area inside the Herodian enclosure remained an open courtyard until Byzantine times. As noted earlier, Josephus records beautifully crafted marble memorial stones over the graves but makes no mention of the enclosure. The fragmentary diary of the anonymous fourth-century traveler known only as the Bordeaux Pilgrim also refers to the “most beautiful memorial stones” in the courtyard but says nothing about the Herodian enclosure. Nothing remains of this church, however. It must have been destroyed to accommodate a mosque that was built after the rise of Islam in the region. In 1188, the area fell to the renowned Syrian warrior Saladin. Although the structure of the building was retained, the building itself was converted once more into a mosque. Saladin also built four minarets atop the Herodian enclosure, but only the ones on the east and west corners have survived. At about this time, stairways were added on the outside of the northwestern and southeastern walls of the Herodian enclosure. Under Saladin, both Jews and Christians were allowed to visit the shrine. The current structures inside the enclosure are, for the most part, the work of the Fatimid Caliphs of the 10th and 11th centuries, although the Mamelukes (13th–16th centuries) also made a number of alterations to the site. The Ottomans introduced only superficial changes. But the large number of owners who desired to leave their imprints on Ma’arat ha Machpelah did create one unwelcome effect- the current arrangement of buildings and hallways appears to the visitor to be, at best, chaotic. The variety of architectural styles—a Crusader column cheek by jowl with Mameluke marble facing—is equally confusing. No organizing principle prevails. The addition of stairways to the outside of the northwest and southwest walls of the enclosure as well as the Jawaliyeh Mosque springing from the northeastern wall increase the labyrinthine feeling of the site. This stylistic chaos and the constantly burning incense, the ubiquitous prayer rugs, and the Niobe-like suppliants randomly sprinkled in different rooms and hallways lend a mysterious atmosphere that affects all who enter. Once inside the enclosure (having entered through “X” on the plan), the modern-day visitor will see in the southeastern portion a mosque in which the cenotaphse of Isaac and Rebecca repose. In front of the mosque is a vestibule or colonnaded portico. Under the portico, on either side of the entrance to the mosque are the octagonal and hexagonal structures housing the cenotaphs of Abraham and Sarah, respectively. In front of this portico is an open court. On the other side of the open court, against the enclosure wall, stands a rectangular building that contains the octagonal and hexagonal structures housing the cenotaphs of Jacob and Leah. How tradition fixed the precise location we identify as Machpelah as the tomb of the patriarchs, we of course do not know—except that by Herod’s time, it was so identified. Thus hallowed, legends accreted. A notice at the conclusion of almost all the other apocryphal testaments of Jacob’s sons tells us that the putative author (and subject of the work) was either buried at Machpelah or instructed his survivors to bury him there. Thus, for example, the Testament of Levi ends with a notice that Levi was buried “in Hebron, with Abraham, Isaac and Jacob” (19-5). In the Testament of Issachar, the patriarch instructs his children to “take him up to Hebron and bury him there in the cave with his fathers” (7-9). No doubt this tradition included all the sons of Jacob, even those about whom no specific mention is made in the apocryphal testaments. By the time of the Talmud (200–500 A.D.), we read that not only Joseph, but also Adam and Eve are in the cave of Machpelah (Babylonian Talmud, Eruvim 53a; Sotah 13a). A seventh-century visitor to Machpelah, Bishop Arculf, records having seen not only the burial place of the three patriarchs and their wives, but also the site of Adam’s burial. The Zohar, a late 13th-century mystical treatise, also supports the belief that Adam and Eve are buried at Machpelah. In addition, the Zohar locates the cave of Machpelah next to the Garden of Eden and suggests that through this cave the souls of the righteous may enter Paradise (Zohar, Lech Lecha 95; Zohar Chadash 58-27). A 17th-century Kabbalist work called Yalkut Reuveni adds both Moses and his wife Zipporah to those buried in the cave of Machpelah (section Zot Habracha). Oddly enough, although numerous ancient reports of visits to the site have survived, descriptions of the underground cave are rare. We hear about Machpelah from Josephus in the first century, but as we noted earlier, he doesn’t even mention the Herodian enclosure, let alone the cave below. References to the site and what may be found there are contained in both the Babylonian and Jerusalem Talmuds, but these texts from the first centuries of the common era give no description of the cave itself. The Bordeaux Pilgrim, cited above, who visited the site in 333 A.D., gives us the first reference to the enclosure but no description of the cave. Antoninus Placentinus, as mentioned earlier, describes a Byzantine basilica on the site now occupied by the mosque but gives no description of the cave. Bishop Arculf (c. 685 A.D.) is the first to describe the cenotaphs, but he tells us nothing about the cave. Stories from Islamic sources report visitors who tried to enter the cave, probably through one of the known openings near the cenotaph of Isaac. One such visitor immediately fell to the ground, and was struck motionless in punishment for this act of sacrilege. Between 1854 and 1861, the Italian archaeologist Ermete Pierotti measured the buildings of the enclosure, but was able to descend only a few stairs leading to the cave below before its guardians literally yanked him away. In 1919, Father Vincent and the English archaeologist E. J. H. Mackay conducted their classic study of the area, but they failed to obtain permission to descend into the hypogeum (burial chamber). The cave thus remains cloaked in mystery. We don’t even know how many entrances give access to it or where all these entrances are. In 1882, Claude Conder led a royal expedition to Hebron that included Prince Albert of Wales.16 According to Conder, the Turkish governor of Jerusalem, Raouf Pasha, showed the party a hitherto unknown entrance to the cave of Machpelah that the governor had discovered shortly before the royal visit. This entrance lay somewhere between the cenotaphs of Isaac and Rebecca, nearer Rebecca’s. In 1523 David the Reubenite, a Jew from Khebor, in northwestern Arabia, refers to an entryway at what seems to be a similar point. According to the 16th-century traveler, the guardians of the mosque showed him “the opening of the door of the cave in the mouth of a pit. There is a lamp burning day and night in this pit, and they let down the lamp into the pit by a rope, and from the mouth of the pit I saw the opening of the door about the height of a man, and I was convinced that it is indeed the cave.”17 Unfortunately, neither David the Reubenite nor Conder was able to investigate this entrance any further, and today it is no longer visible. Today, two entrances to the cave are known, both located in the mosque that covers the southeastern part of the Herodian enclosure. 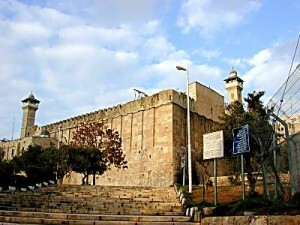 One is marked “A” on the plan and is located just inside the mosque wall; it is adjacent to the southwestern wall of the chapel housing Abraham’s cenotaph. This opening, which is marked by a protruding shaft whose mouth is covered with an iron grille-work, is topped by a gracefully arched stone canopy. The second entrance, marked “B” on the plan, is also located inside the mosque and is adjacent to the minbar (the Moslem pulpit, built by Saladin in the 12th century), next to the enclosure wall. A similar structure with a flat roof stands over this entrance to the cave. The opening in the floor at point “B” is just below a hole or crack now covered with cement in the outer wall of the Herodian enclosure. On the outside of the enclosure at this point was the seventh step of a staircase, now removed. Beginning in 1266, when the Mamelukes came to power, Jews and Christians were permitted to ascend no higher than this seventh step. There they looked through the hole in the enclosure wall over the entrance to the cave. The seventh step limitation for non-Moslems lasted until the Six-Day War in 1967. Shortly thereafter, the stairway was in part removed, and the hole or crack cemented over. The former hole or crack can still be identified by tapping on the wall, which sounds hollow at this point. The only relatively detailed ancient description of the subterranean cavern beneath the enclosure comes from the Crusader period when, in 1119, the caves were entered through the opening in the mosque floor at point “B.” An anonymous chronicler, perhaps, Vincent suggests,19 a clergyman of the order of St. Augustine—recorded the tentative explorations of the religious guardians of the Machpelah as told to him by the principal investigator, a monk named Arnoul. One day, a monk entered the church area to escape the June heat. All of his brothers had claimed couches for themselves, so he lay down on the flagstone floor near the cenotaph of Isaac. After he lay down, the monk noticed a gust of wind blowing through a crack between the flagstones. He removed the flagstones and found a deep hole, which, with the aid of a rope, he determined to be 11 cubits or about 17 feet deep. He told the other monks of his discovery, and, after much excitement and speculation, Arnoul was chosen to be lowered into this shaft by a rope. At the bottom of the shaft, Arnoul found himself in a cave. The cave was apparently lined with masonry similar to that of the Herodian enclosure wall. He pounded on the masonry walls of the cave with a hammer until he found a place that sounded hollow. Behind this hollow spot, Arnoul, now joined by other monks, discovered a long narrow corridor also lined with masonry, which Arnoul notes was as fine as that in the cave. After four days’ labor, Arnoul and his fellow workmen reached the end of the corridor and found a rock that he removed, disclosing the entrance to a “fabulously crafted [room], round like a basilica.” The room, which he said could hold 30 people, was empty. The next day several monks went down into the cave to pray. Upon entering the cave where Jacob’s bones had been found, they noticed an inscription on the wall in a language they could not understand. They removed the part of the wall containing the inscription but found nothing. They then decided to remove the wall opposite the inscription. There they found approximately 15 jars filled with bones which they identified as the bones of Jacob’s 12 sons. This subterranean passage leading to the burials of the patriarchs and their wives was entered frequently for a time after the 12th century discovery. In Arabic, the passageway became known simply as the serdab—that is, underground passage. In 1163, Benjamin of Tudela, a Jew from Spain, visited Hebron. He reported that if a Jew paid money to the gatekeeper, the latter would open “a gate of iron which was made in the days of our ancestors, and then he is able to descend below by means of steps, holding a lighted candle in his hand. He then reaches a cave in which nothing is to be found, and a cave beyond, which is also empty; but in a third cave the visitor comes upon the veritable six graves of Abraham, Isaac, Jacob, Sarah, Rebecca, and Leah. They bear an inscription as follows ‘This is the grave of Abraham.’ ‘This is the grave of Isaac,’ etc. A lamp burns in the cave over the graves day and night, and one finds there casks full of the bones of Israelites, as the members of the house of Israel were wont to bring the bones of their fathers thither and they deposited them there to this day.”22 By the time of Benjamin’s visit, apparently the graves of Sarah, Rebecca and Leah, which had escaped the notice of Arnoul in 1119, had been found. This fairly summarizes our knowledge of the underground cave system until Israel captured the site in 1967. In that year the late Moshe Dayan, then Israel’s Minister of Defense, and an amateur archaeologist and antiquarian,i exercised his authority to explore the sacred cave of Machpelah. None could enter at “B” on the plan where the Frankish monks had lowered Arnoul, and where Benjamin of Tudela and others had entered by means of steps, because four iron pegs now held in place the stone (or stones) wedged over the opening. Accordingly, the cave was entered by the shaft under the stone cupola that sits on the opposite side of the mosque (“A” on the plan). In his popular work Living with the Bible, Dayan says that he attached a rope to a young girl named Michal who then slid through the narrow shaft opening at point “A.”j The upper part of the circular opening is cut through a marble slab only about 11 inches in diameter. The lower part of the shaft is cut through the rock and is considerably wider—24 inches. This rock shaft is about three feet deep. The bottom of the rock shaft creates a hole in the ceiling of the carve below. The floor of the cave is 12 or 13 feet below. Michal found the room to be nearly square, however, measuring 9.65 feet by 9.26 feet. This is the large room at the end of the long corridor that Arnoul had entered 850 years earlier from the other end. Arnoul had said this room was large enough to hold 30 people and described it as round like a basilica. Apparently Arnoul was referring to the ceiling rather than the walls of the room. The ceiling, which is octagonal, easily looks round.25 The walls of the room go straight up for about four and a half feet; then they begin to arch. A vault is built on top of the two longer walls. The floor is paved with stone tiles. On the southeastern wall of this room a sunken step leads down to a doorway—the doorway to the long corridor that leads to the stepped entrance to the cave system. This corridor is indeed narrow—less than two feet wide—but that is wider than Arnoul described it. He said it was only one cubit wide, about 18 inches. The corridor is also twice as long as Arnoul described it; Michal measured it at 57 feet. The corridor is less than 3.5 feet high. The walls are lined with large, well-cut and well-fitted ashlars. The ceiling of the corridor is constructed of stone slabs. Arnoul did not describe the steps leading up from the corridor because they were probably installed after his initial exploration. They are there now, however. According to Dayan’s report, there are only 16 steps, not 70. At the top of the stairs, the iron pegs that secure the stone covering the opening (marked “B” on the plan) can be seen in the cavern’s ceiling. A shaft four feet high separates the top of the stairs from the floor of the mosque above. The upper level of this cave (at the top of the stairs) is blocked off by a stone wall. But what about the rooms that Arnoul describes beyond the room big enough to hold 30 people—the room into which Michal first descended? “[There is no God but Allah, He is the Living, Eternal One.] Sleep seizes him not, nor slumber; all that [is on heaven and earth is his!] (Koran, Sura 2- verse 255). The other two slabs, or tombstones, were smooth. From Michal’s report, Dayan could not tell whether these stone slabs were attached to the wall of the cave or whether they block the entrance to the grottoes described by Arnoul. In any event, that is all Michal saw. No artifacts, other than the inscribed slab, were found. The masonry that lines the corridor and the cave at the end of the corridor appear to be Herodian, so this masonry was probably installed by Herod as part of the same project as the building of the enclosure wall. It is likely to be a long time before we learn anything more about what lies underground at Machpelah. But as we learn in “Was the Site of the Temple Originally a Cemetery?” by Rivka Gonen, the caves of Machpelah were probably originally used as a cemetery in the period archaeologists call Middle Bronze I (2700–2000 BC). a. In Arabic, the platform created by an enclosure wall is called a haram. b. Except Rachel. Rachel, Jacob’s best-loved wife, the mother of Joseph, the best-loved son, died in childbirth on a journey from Bethel and was buried “on the road to Ephrath—now Bethlehem” (Genesis 35-19). c. An ashlar is a hewn stone, often used for facing a wall. d. An ell is about 45 inches. e. A cenotaph is a tomb or monument erected in honor of a person whose body is elsewhere. f. Pseudepigrapha means literally books with false titles, and refers to extra-canonical writings, many of Jewish origin. g. Note the conflict about the place of Joshua’s burial between the Book of Joshua, on the one hand, and the apocryphal Testament of Joseph, on the other. This may suggest that the author of the apocryphal testament did not have an authoritative, canonized text of Joshua that in turn would dictate where Joshua was buried. This suggests that the text of Joshua as we know it was probably not fixed and canonized before the second century B.C. In any event, we see how early the traditions concerning additional burials at Machpelah arose. h. However, in the opinion of one prominent Israeli archaeologist who is an expert on Ma‘arat ha-Machpelah these steps are almost surely Herodian—to a “95%” certainty. Then why were the monks lowered by a rope if they could have walked down the stairs? This remains a puzzle, according to the Israeli archaeologist. Apparently the area was filled with dirt that took the monks four days to clean. With the dirt in place, the opening appeared much like a slanted shaft. Why does the archaeologist think the steps are Herodian? Because they lead to another corridor at the top of the stairs. This upper corridor leads outside the enclosure. The upper corridor is blocked today after a mere half-meter. But enough could be seen to establish that it is of the same Herodian construction as the lower corridor. Therefore, the steps serving as part of this corridor system must also have been Herodian. The upper corridor probably led to an ancient Herodian—or even earlier—entrance to the caves from outside the enclosure. But how can he know about the upper corridor and its Herodian characteristics? No comment. Apparently, at least one other Israeli, in addition to a 12-year-old named Michal whose entry during the Dayan exploration is described later in this article, has been down in the cave system. But how did he get inside? As is recounted in the sidebar, even a thin soldier could not get through the shaft. That is why 12-year-old Michal was chosen by Moshe Dayan for the entry. Is there another, unknown opening? Or did someone briefly remove the floor slabs surrounding entry-shaft “B,” thereby exposing a shaft two feet in diameter in contrast to the 11 or 12-inch hole in the floor slab?—Ed. i. See Leroy Aarons, “The Dayan Saga—The Man and His Archaeological Collection,” BAR 08-05. 1. Moshe Dayan, “The Cave of Machpelah—The Cave Beneath the Mosque,” Qadmoniot Vol IX, No. 4, p. 129 (1976). 3. As David M. Jacobson has noted, “The excavations conducted by Professor Mazar near the Temple Mount have at last provided satisfactory archaeological proof that the drafted masonry there [in the Temple Mount enclosure] is Herodian.” “The Plan of the Ancient Haram el-Khalil in Hebron,” Palestine Exploration Quarterly (PEQ) 113 (July–December 1981), p. 73. See Benjamin Mazar, The Excavations in the Old City of Jerusalem Near the Temple Mount- Preliminary Report of the Second and Third Seasons, 1969–1970 (Jerusalem, 1971). 5. Rev. Canon Dalton, “Note on the Hebron Haram” (PEQ) (London- 1897), p. 54. 9. Jacobson, “The Plan of the Ancient Haram.” See also Claude R. Conder, “Report on the Visit of Their Royal Highnesses Prince Albert Victor and George of Wales to the Hebron Haram, on 5th April 1882,” Palestine Exploration Fund Quarterly Statement (PEFQS) (London, 1882), p. 198. 10. Guy LeStrange, Palestine Under the Moslems (New York- AMS Press, reprint of 1893 edition), p. 315. 11. LeStrange, Palestine Under the Moslems, p. 325. LeStrange quotes at length an English translation of Mujir ad-Din al-Ulaymi. 12. Dalton, “Note on the Hebron Haram,” pp. 54–56. 13. Itinera Hierosolymitana et Descriptones Terrae Sanctae, ed. Titus Tobier and Augustus Molinier (Otto Zeller- Ohsbrueck, 1966), p. 108. 14. Louis-Hugues Vincent and E. H. J. Mackay, Hébron—Le Haram el-Khalíl (Paris- Editions Ernest Leroux, 1923), pp. 83ff. 15. LeStrange, Palestine Under the Moslems, pp. 309–310; 314–315. 16. Conder, “Report on the Visit of Their Royal Highnesses,” pp. 230ff. 17. Thomas Chaplin, “The Visit of David the Reubenite to Hebron and Jerusalem in A.D. 1523,” (PEQ) (London- 1897), pp. 47ff. 18. Vincent and Mackay, Hébron—Le Haram el-Khalíl, pp. 58ff. 19. Vincent and Mackay, Hébron—Le Haram el-Khalíl, p. 167. 20. Vincent and Mackay, Hébron—Le Haram el-Khalíl, pp. 168ff. 21. Vincent and Mackay, Hébron—Le Haram el-Khalíl, p. 167; Comte Riant, “Invention de la Sépulture des Patriarches,” Archives de l’Orient, Vol 2 (Ernest Leroux- Paris, 1884), p. 418. 22. Marcus N. Adler, “Jewish Pilgrims to Palestine” (PEFQS) (London- 1894) pp. 296–297. A similar description is given by another Jewish traveler who visited the cave in 1220. 23. LeStrange, Palestine Under the Moslems, pp. 317ff. 24. LeStrange, Palestine Under the Moslems, pp. 319ff. 25. Vincent and Mackay, Hébron—Le Haram el-Khalíl, p. 198ff. Vincent also notes that the description Conder gives of the shaft leading to this chamber as being “covered by a stone like those at the mouths of the wells in Palestine, rising above the church floor” (Conder, “Report on the Visit of Their Royal Highnesses,” p. 200), indicates a rounded opening.